Third in a four part series. Your child comes home seeming a bit out of sorts; this has been going on all week. He sits on the couch and doesn’t make eye contact when you ask how was his day. His body language is telling of another trying day at school but as with most elementary school age children, doesn’t willingly open up about why he is so glum. By teaching your child about bully behavior at a young age, they will learn how to spot it as well as how to avoid it. After the 20 questions, a sporadic line of questioning and casual ‘pretending-to-be-casual-chit-chat’ inquisition, little Timmy mentions that two kids at school who he considered his best buds, now won’t play with or talk to him because another child made up a story about him last week that now, every kid in his class believes. It continues…your child has been isolated at school; purposely not included during after school play, is given scrap paper notes saying “you stink and everyone agrees,” and by the end of the second week, the whole 4th grade was lobbing against him. The wildfire of indirect bullying took hold and to a child, seems like it would never end. By teaching your child about indirect bullying at a young age they will learn how to spot it as well as how to stop bully behavior and avoid it. Most schools are starting to teach about this and are actively working to eliminate bullying from the classroom environment altogether. However, this is not something that will just go away over night. The best thing you can do is be an advocate for your child. Make sure you know what’s going on with them at school everyday. Even if you simply talk while eating dinner or driving home from school, this is an essential part of keeping your child safe from bullying. Everyday teens commit suicide because of bullying at school from both direct and indirect bullying. This is why you should know what is going on with your child. There are great resources available both online and at your local library and health departments. A comprehensive offering of publications, handouts, posters and tips can be found https://www.pacer.org/bullying/resources/publications/ . 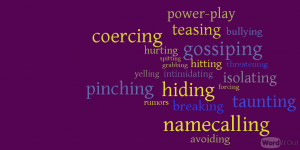 Have you or someone you know been the target of bully behavior? Send us a note; we’d love to hear from you and how you handled the situation. Visit PersonalBabyProducts.com and PersonalizedKidsPlates.com to stay up-to-date on topics, tips and articles written especially for parents. We welcome you to share, repost and re-tweet our news, ideas and stories with your social media network. Or, simply subscribe to our RSS feed or newsletter below.